This is the workroom dedicated to cataloguing posters and other graphic arts materials such as production art, costume and set design. Reproduced by their lab, mounted and hung is a selection from their main and special poster collections. In fact, the library has an amazing lab facility, responsible for creating duplicates of original materials for any and all uses. Reference, research, in-house display and online use keep them busy. Original materials are reserved for museum exhibition. As I stand on the threshold of the graphic arts stacks, my breath transforms to plumes of vapor. It is icy in here. 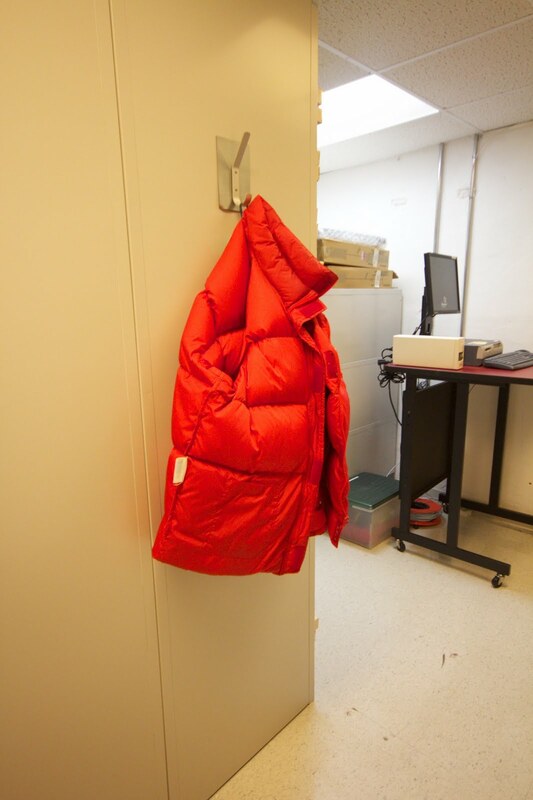 This is the handy communal arctic wear to keep staff from becoming turning blue. And brightly coloured so they may be spotted if they get lost in the nooks and crannies of these stacks. These rooms were originally designed to house film stock (hence the chill), when the Academy's film archive shared the Fairbanks site. The film archive has since expanded (with staff numbers increasing 30 fold), and inhabit their own quarters in Hollywood. Another historical titbit on the sites of this fine Academy- the Film Archive facility is now in the oldest surviving television studio in Hollywood, the Pickford Centre for Motion Picture Study. The Library also has several storage vaults at the Pickford Centre- and the huge cement sound stages of it's era have proved incredibly apt for maintaining climatic conditions for archival purposes. Here in the Graphic Arts stacks are the Poster collection (at 38 000 pieces), the Costume and Set Design collections, and in the coldest corner, the photographic collection of negatives and transparencies.